Coaster Photo – Neptune’s new Township Committeewoman Carol J. Rizzo was sworn in by Mayor Kevin McMillan at this week’s meeting. 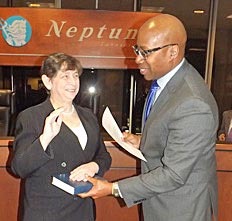 Resident Carol J. Rizzo was appointed to the Neptune Township Committee Monday night to fill the unexpired term of Eric Houghtaling, who took office in the State Assembly earlier this month. Rizzo, an Ocean Grove resident since 2001, said it is “a thrill and honor” to be appointed to the governing body, which has been all-Democratic since Republican Thomas A. Catley retired in 2008. “I plan to fulfill the pledges I have made to residents in the past and will work to make the township better,” she said. Rizzo said her pet issues coming onto the governing body are economic development and bringing businesses and jobs to the township. “I want to create businesses with good jobs. All businesses are good but I want to focus on the high-tech health care industries,” she said. Rizzo is a business consultant and has worked with different businesses on their short- and long-term development strategies. She is a current member of the Neptune Board of Adjustment, from which she will now resign, and the Neptune Township Economic Development Corporation, for which she will probably now become a liaison. She is also on the Advisory Board for Emerge NJ. Once Houghtaling resigned, the Monmouth County Democratic Party had to present three viable candidates to fill his seat within 15 days of him stepping down. The governing body then had to choose one of them within 30 days. The three nominees presented were Rizzo, former Committeeman James Manning Jr. and Robert Lane. Committeeman Randy Bishop also announced recently that he will be leaving his position, probably next month, to take job as the Deputy Commissioner for Administration of Elections for Monmouth County. The same process will be followed to find a replacement for Bishop. Both Rizzo and Bishop’s replacement will have to run in this November’s general election for full, three-year terms. Rizzo, who is now the only women on the governing body, was the 2015 Democratic candidate for a Monmouth County Freeholder seat.